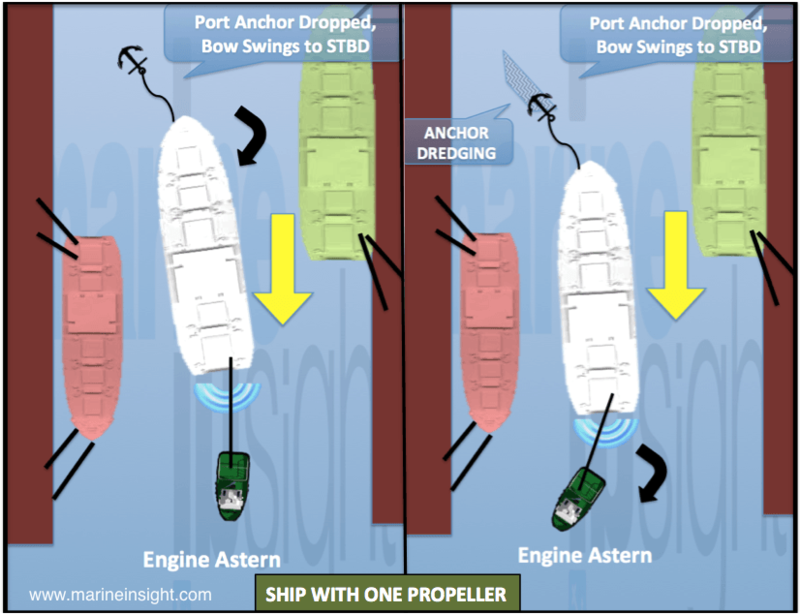 How Dredging Anchor is Used for Maneuvering Ships? ГлавнаяМорское ЧтивоShip NavigationVarious Aspects of Ship HandlingHow Dredging Anchor is Used for Maneuvering Ships? Ship's anchors can be used not only for berthing but also during maneuvering through channels and other similar areas with restriction in movement. Dredging anchors is a method which is used to assist a ship in maneuvering during unavailability or inability of tugs to assist as required. A dredging anchor sniffing the bottom of the ship would hold the bow steady while allowing a ship to move fore and aft, this would shift the ship’s pivot point forward. Then, to overcome the anchor’s drag, propulsion is used giving good steering at low speed. Today, modern ships have bow-thrusters to control the bow while going ahead or astern. While piloting in the narrow confines, in restricted waters or maneuvering vessels in somewhat constricted space, bow thrusters or tugs can be handy. 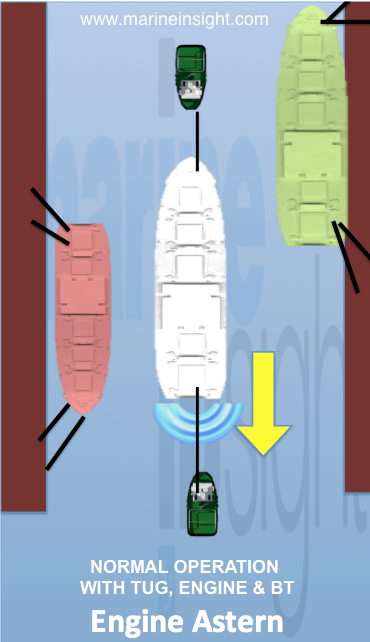 Sometimes ships have to cross stern first (i.e., moving backward) through the restricted channel between ships or buoys, using engines and bow thrusters. 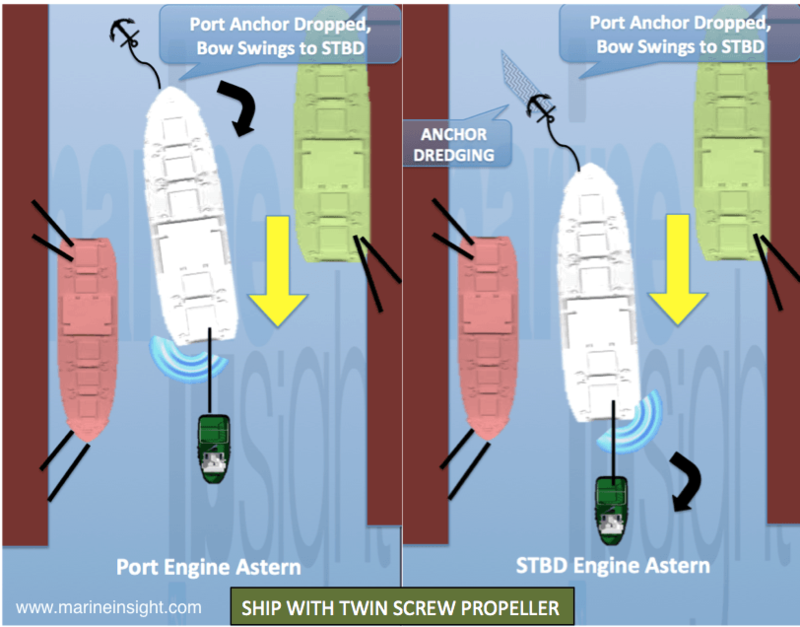 Now since the stern cants (moves laterally sideways) while a ship comes astern due to transverse thrust, a towing tug is employed in this case at the stern and the engine is used sparingly just to adjust any deviation in the desired direction of motion. At the bow of the vessel, a checking tug is also deployed to control it and prevent it from swinging waywardly. The checking tug also comes in to play in stopping the momentum of the ship lest its engine doesn’t respond in time. Now what happens when there is neither a bow thruster nor a tug to check the bow? The towing tug is necessary as the ship will invariably deviate with every second of the engine running astern due to the transverse thrust. In such an emergency situation the anchor becomes the rescuer. The anchor is dropped at short stay where the cable is almost vertically down up to the anchor and taught. The anchor barely digs in when the ship is put to astern and the anchor is dragged over the sea bed. The pivot is shifted to the bow near the howse-pipe, making it easier for the towing tug at the stern to exert more moment of force as its distance from the pivot has increased. Also, the bow is prevented from “Yawing”. The objective of this operation is to drag the anchor over the soft mud (like the drag-heads of the suction dredgers) and not to dig the anchor deep into the mud. Otherwise the cable will come under huge strain and can part when engine is run astern or when the towing tug tows. The machineries involving the anchor on the forecastle, like the windlass, the bow-stopper or the brakes can also get damaged. Ideally the length of the cable should not be one and a half to two times than that of the depth of the water. Moreover, it is generally advised to have a thorough knowledge of the sea or river bed before performing this operation. Recent survey charts in this case can become extremely helpful.